As you may already know, the KOMONO category of the KonMari method is huge. It is made up of many items and it is different for everyone. 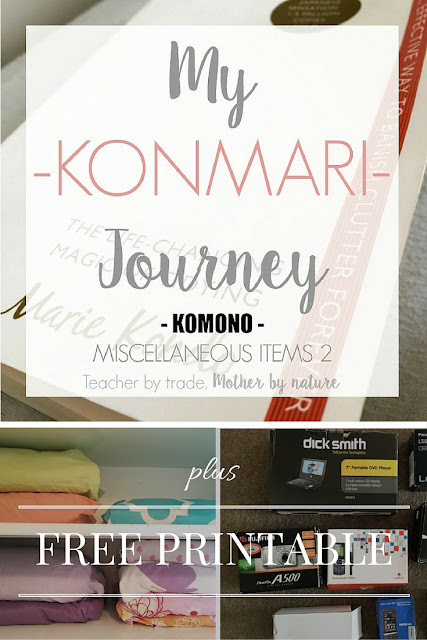 Now that I am at the end of the KOMONO category, I thought I would share some of the extra items that Marie Kondo has mentioned in her book before getting stuck into one my of biggest KOMONO items - Teacher Resources. 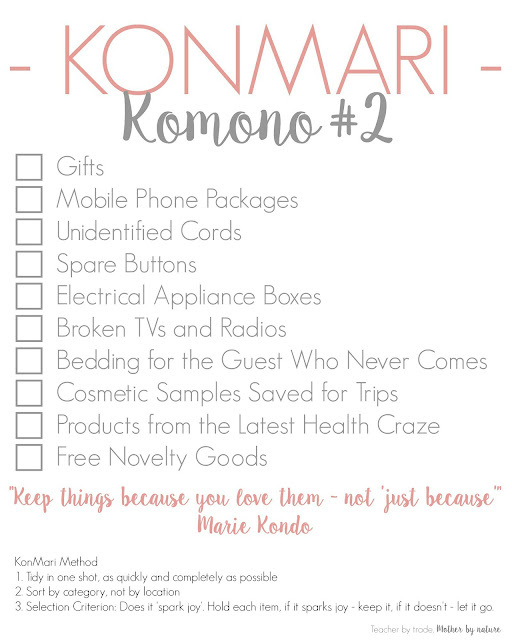 These are items that you may have kept 'just because' - by now you will notice that Marie Kondo doesn't keep things 'just because'. They either spark joy or have a use or purpose. So here are 10 things for you to purge (if applicable). Gifts - when we receive gifts from family, friends, colleagues, kids etc...we feel obliged to keep it all, however there is no point in keeping something you are never going to use, right? The 'spark joy' moment occurred when you received the gift - if you don't use the gift, thank it and pass it on to someone who will. Mobile phone packages - I was one of those people who kept the mobile phone packages and everything that came with it 'just in case' - I found several when I was purging my Electronics. I have only kept my iPhone case because it's perfect for storing some of my smaller items in my drawer. The rest I purged and it felt great. 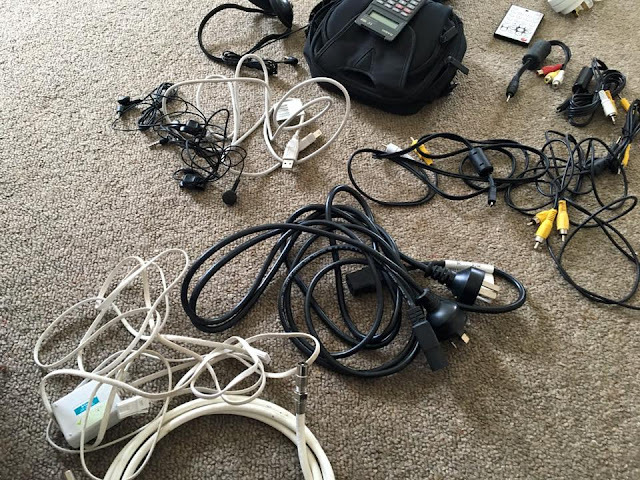 Unidentified Cords - I came across quite a few 'miscellaneous' cords when I tackled my Electronics. As long as all of the items we use in our home had a cord, anything left over was discarded (or donated). Spare buttons - you know the extra buttons that come with jeans and cardigans etc...have you ever used them? Electrical Appliance Boxes - keeping old electrical appliance boxes 'just in case' you want to re-sell the item or use it for moving is just taking up precious space in your home. When I went through my kitchen cupboards, I found a couple of empty boxes that were just sitting there...fair to say, I had a little giggle and put them straight into the recycling. Broken TVs and Radios - if you're not using them or they are not working - get rid of them. 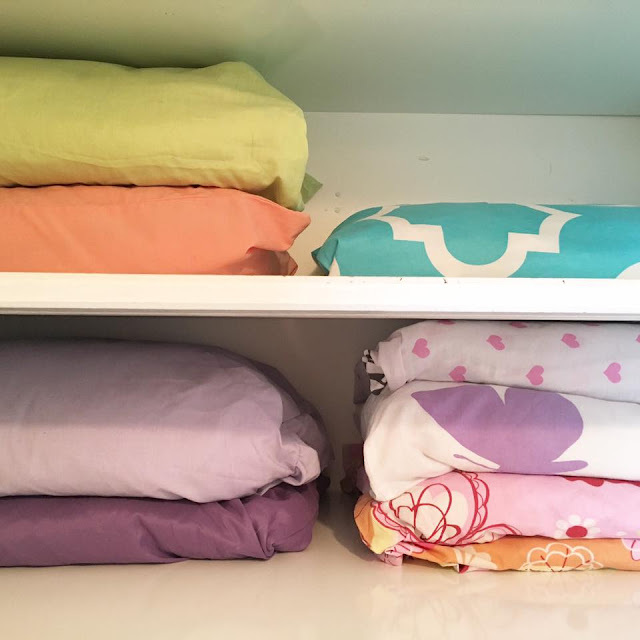 Bedding for the guest who never comes - when I did our Linen cupboard, I did think about bedding for guests, however, we hardly ever have guests stay but if we do, they end up bringing their own bedding. If we need to, we just use the extra bedding we have for our own beds. No point in having a cupboard full of sheets and blankets that are never going to be used - they will just get smelly after a while. Cosmetic samples saved for trips - I used to collect small soaps, and travel shampoo and conditioners but I never used them and they just expired, so in the bin they go. Free novelty goods - there are so many novelty items that may seem awesome at the time but really, do you use it? will you use it? Does it 'spark joy'? - if not - purge. Do you have any of these items scattered around your home? Today is the day to purge the items that no longer spark joy! 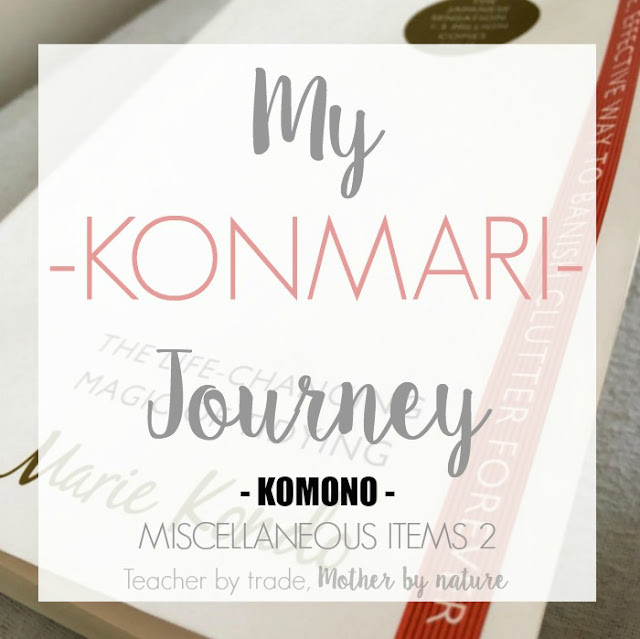 If you would like to give the KonMari Method a go, and you don't have the book - Here is a checklist of the second party of the fourth category - KOMONO - Miscellaneous Items 2. Click the image below and Save/Print. You can also view my previous checklists HERE.